We’re always happy to add another entry to our growing list of creatures. Fortunately for us, a few weeks ago we received this very cool photo from Mari Molenaar, a neighbor and member of the Princeton Landing Board. Mari photographed this praying mantis on her deck in Parcel 7. So far we’ve written about the Differential Grasshopper, the Angular-winged Katydid and the Daddy Longlegs. So I asked our Nature Guide Jon Latimer to give us a few facts about the praying mantis. Mantises are an order of predatory insects that contains more than 2,200 species worldwide. Two species are common in our area. Both have slender bodies that resemble twigs and serve as camouflage. Both also have two spiked forelegs. When they are held in an upright position, it looks like the mantis is praying, which is why they are called praying mantis. The Carolina Mantis (Stagmomantis carolina) is native to our area, but is more common farther south. It grows to about 2½ inches long and its color ranges from dusty brown to gray or green. The larger European or praying mantis (Mantis religiosa), above, is far better known and more widespread. It can grow to 3½ inches long and its color ranges from tan, like Mari’s, to bright green. A native of Europe, this species was accidentally introduced into the US in 1899 in a shipment of nursery plants. These praying mantises thrived in their new home and spread throughout the eastern US. The species has even been named the official state insect of Connecticut. 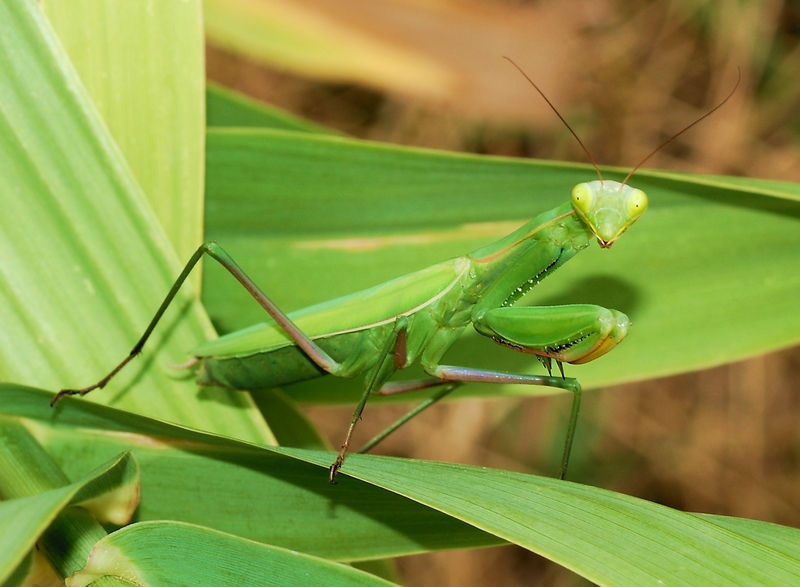 Mantises are often considered “good” bugs because they prey on insect pests that can injure garden plants. Actually, they are formidable hunters who will pursue anything small enough to be successfully captured and eaten. Their color and shape allow them to blend into the foliage around them and ambush their prey. They use their forelegs to catch and hold their quarry and usually devour it very quickly. Mantises are known to hunt butterflies and moths, caterpillars, aphids, flies and various other insects. In walks and bike rides around PL, I’ve seen many people, dogs, birds, trees, flowers and other living things that give me much pleasure. PL is a fine place to live. Thanks so much for featuring my Mantis photo.